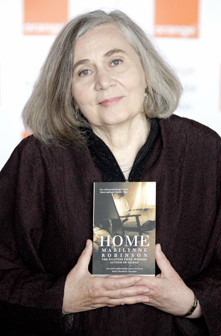 Marilynne Robinson is a thoughtful contemporary novelist. Her first novel, Housekeeping, was nominated for the Pulitzer Prize for Fiction; her second, Gilead, won the Pulitzer; and her third novel, Home, has received numerous awards. Most remarkably, Robinson has received this acclaim from critics and the reading public while filling her novels with Christian characters and themes. As the title hints, Home, touches on themes shared with the parable of the Prodigal Son. Use these suggestions and questions to guide your reading, then return to them as you reflect on your reading. How is Jack like and not like the younger son in the parable? What is Jack's underlying sin/flaw? Is Rev. Boughton the father in the parable or the elder son or both? What is Rev. his underlying sin/flaw? Is Glory the elder son in the parable or the father or both? Does Glory have a sin/flaw? the house, meals, the television, baseball, the moth, the oak tree, the barn, the car, others? in the very simple narrative of the parable of the Prodigal Son? 5) How are the following pivotal moments characterized by both transcendence and tragedy? 7) What is the role of race in this novel and does it have any relationship with the parable? 8) What are some of your favorite quotes from the novel?